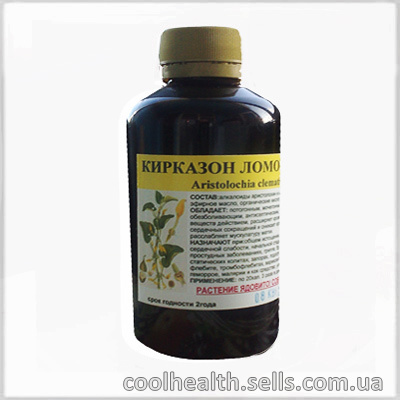 Hypertension High blood pressure Hypertension Shortness of breath treatment Kirkazon Lomonosovidny Tincture application properties buy store of traditional medicine. Treatment of Hypertensive diseases at home by extracts of health. Kirkazon lomonosovidny or ordinary is a perennial vine, family Kirksnove. The plant has a creeping rhizome, with matt green rounded leaves with an unpleasant odor, hairless erect stem. The flowers are tubular forms have a light yellow color and are placed in bundles in leaf axils. The fruit has the form of hanging boxes, with triangular seeds. Flowering time kirkazona is the beginning of summer and it bears fruit with the month of July. Prefers to grow near water, in shaded forests, on flood plains, wet soils, limestone. In our time, the use of plants in many countries is limited (it is planted, in the form of beautiful vines for vertical gardening personal plots and gardens). The chemical composition of Kirkazon Lomonosovidny. In addition, Aristolochia the leaves contain organic acids and carotene. The plant is poisonous, so an overdose kirkazon can cause destruction of the lining of the stomach and intestines. Contact kirkazon can cause an allergic reaction, the type of chemical burns ( I - II degree). Treatment should be carried out only under medical supervision! Avicenna called this plant - Aristolochia, which means is the best tool that could be recommended to expectant mothers. relaxes the muscles of the uterus. as a means of enhancing menstruation. Usage: take 20 drops 3 times a day diluted in 100 ml of water.